Sugar the Seal is just so real! 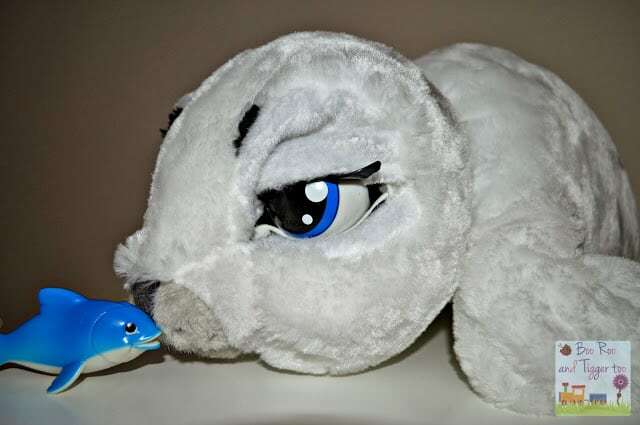 Meet the latest addition to the Emotion Pets range – Sugar the Seal! Isn’t she cute?! 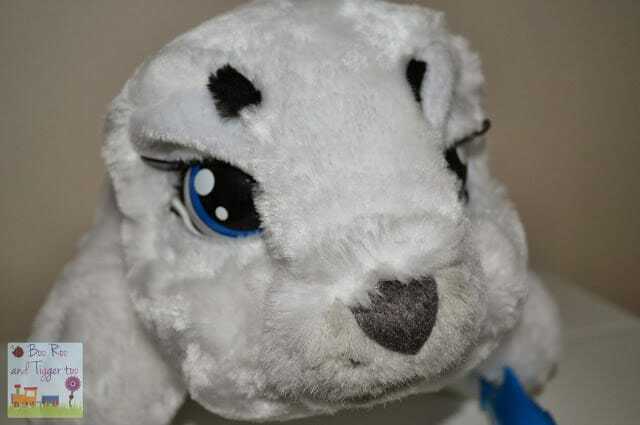 As Roo has not had any of the previous Emotion Pets I was unsure what to expect when we were asked to review Sugar the Seal. My first impression was that she is much bigger than I expected, I must admit to thinking it would be fairly small and flimsy. Sugar comes packaged in a large box complete with her little whale friend. At 45cm long she is a substantial toy and weighs around 1.7kg so quite weighty for a ‘cuddly toy’. Look into those eyes, how can you not fall in love with Sugar? What does Sugar the Seal do? A. I’m awake! I need your loving care and attention. I blink my eyes and move my flippers and tail! B. I’m hungry! Feed me with my delicious fish! Watch me chew and hear me munch. C. I’m scared! I get scared when I hear a loud noise and I close my eyes and move my tail. I relax when you cuddle me. D. Cuddle Me! Stroke me on the back or under the muzzle and look after me, otherwise I will call for you! E. Don’t leave me alone! I’ll move towards you if you leave me alone on the floor! F. Time to sleep! I never want to leave your side… I’m so soft and cuddly… Hug me all through the night! The interactive side of the Emotion Pet really got Roo wanting to know more about how to play with it, looking after it and listen to the various sounds that Sugar makes. Sugar requires 4x AA batteries in order to operate (as always I do recommend that you buy rechargeable batteries to save yourself some money in the long term on buying replacement batteries). The noise that the motorisation makes when Sugar blinks, wiggles her tail or moves is quite loud and can takeover the noise made from the action she is doing i.e. feeding etc. Roo didn’t seem to phased by this so I can see parents being more concerned over the noise than the child interacting with Sugar. I had hoped to make a little video to show you the actions that Sugar the Seal does, however her movements on carpet are limited. Whilst you can make out her moving her eyes, eating and lifting up her flippers it is when she comes to follow the child that she doesn’t really go anywhere. As soon as she is placed on a smooth surface she is able to move freely so maybe make sure you have a clear coffee table or desk that they can use if they want Sugar to move along with ease. Roo thoughts Sugar was so cute and with each new interaction I could see that she was smitten with her new Emotion Pet. She was disappointed that Sugar wouldn’t move on her bedroom carpet however after clearing her desk she was once again happy when Sugar ‘swam’ across the desk. Personally I can see the attraction of these types of pets, I would love to see an app to go with the pets so that the child can then look after and interact with their new friend on a different level. With a RRP of £59.99 I do think it is a little expensive for a moving cuddly toy, however if you can find it on offer I would say that it will give your little one hours of fun and if nothing else something cute to cuddle up to at night. 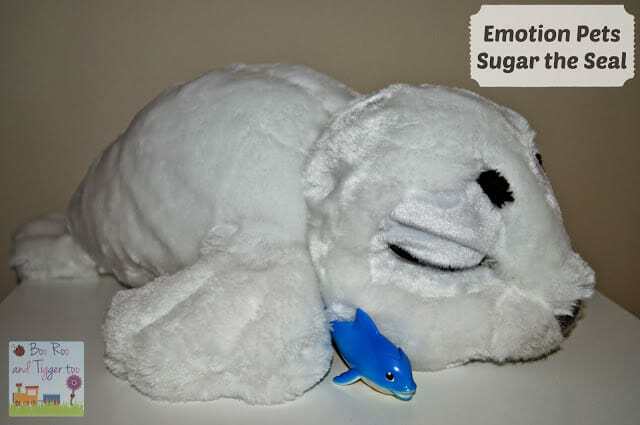 Disclosure Policy: We received Emotion Pets Sugar The Seal FOC for the purpose of review.